“One’s Personal Legend is what you have always wanted to accomplish. Everyone, when they are young, knows what their Personal Legend is. At that point in their lives, everything is clear and everything is possible. They are not afraid to dream, and to yearn for everything they would like to see happen to them in their lives. But, as time passes, a mysterious force begins to convince them that it will be impossible for them to realize their Personal Legend. Each one of us contains an infinite source of innate potential, even though it may seem contradictory to perceive someone and how they may appear, verses their true potential that will eventually manifest in their lifetime. Similarly, a lotus pond prior to the blossoming of lotus flowers, often appears as murky water with the leaves of the lotus plants appearing to float on the surface of the water. 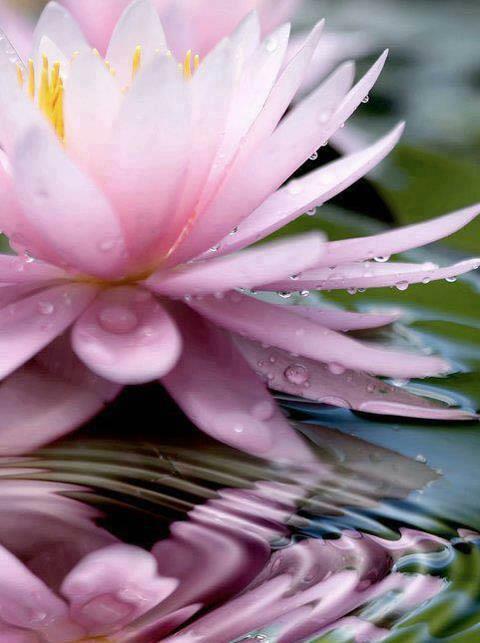 Yet, in due time the most exquisitely beautiful lotus flowers break through the dirty water as buds, which slowly begin to open in majestic spender, spreading their infinite beauty, fragrance, and spiritual vibration. The once murky looking pond is transformed into a spectacular display of natures finest beauty, the fully blossomed lotus flowers transcend the pond with their captivating beauty. In essence, this is the metaphor for the lives we are all living as we struggle to embody a deeper sense of meaning and connection not only to who we are, but how our sense of self transfers into the larger world. Often we have a very clear idea of what we would like to create and bring forth into our lives, even if the means are not apparent. Some of the most innovative people of our time have been alone, unsupported, and struggling to make others understand what they were trying to create and bring forth into the world. There are also numerous stories of highly successful people, who in the beginning, prior to gaining ‘success’ were struggling, living in poverty, and facing extremely challenging situations that they could not fathom a way out of. However, each of their ideas transcended the challenges that they faced; like writing a book, such as the author of Harry Potter who tried thirteen times to get her first book published and was living in poverty; to be a journalist, such as Oprah, who we all know her life story; or Vandana Shiva, who advocates for seed freedom and biodiversity of food sustainability through challenging the hegemony of corporations like Monsanto for the past 25 years, despite her academic education as a PhD in Quantum Physics. What all of these people have in common is a driving goal that they most likely have felt throughout a large portion of their lives. Each of these people felt such a strong conviction to manifest their ideas into a reality, even though many of those dreams took most of their lives to unfold and accomplish. I am not by any means equating myself or anyone else with the latter group of individuals, I am only suggesting that we all have a tremendous untapped potential that is far greater than we can ever conceive and we are all here to create something that is innovative, even if that only affects our own life. We all live in a society that homogenizes people into very specific and socially acceptable categories of how you are allowed to be as a person in regards to how you act, present yourself, and live your life. If you step out beyond those ascribed norms into a paradigm that is not mainstream, you had better have a lot of inner strength to stay grounded, as difference triggers immense fear in others. I was born into a highly unconventional family, raised in a highly unconventional and highly creative fashion that allowed my siblings and I to have immense freedom of a physical nature (to wander through the wilderness), intellectually, creatively, and to create games and play that were highly innovative and unique to ‘normally’ raised children. The byproduct of such a childhood for me was that I was allowed to be difference, even if others did not fully accept me, it was my birth right to do what I wanted to do in life and no one was going to deter me from living the life I wanted to live. In this way, I realized early on that we all have potential to be who we want to be, to embody certain paradigms of thought that created a sense of self, even though for me I was living my life as an authentic version of who I saw myself to be as a person. I was never overly concerned with success or monetary gain. I have always been far more interested in living my own authentic version of inner reflexivity, as breathing life through the lifestyle that consumes me and is an ubiquitous part of myself; the holistic and spiritual way of living that has become my entire life. However, it has taken a tremendous amount of time, education, work, and numerous challenges in life for me to fully realize exactly what aspect of my potential to galvanize into my current practice and allow these to unfold. Moreover, one thing that we all must know is that there are certain times for everything in our lives to manifest, for there are numerous lessons both challenging and rewarding, which can be one and the same. Often challenging circumstances teach us about ourselves in the most honest manner and we can learn where our strengths and weaknesses lie within ourselves, which is very powerful to know. All of our actions are like seeds in life that we plant, all consequences we must face sooner or late, yet there are also certain seeds that we intentionally plant in the soil of our life. Our inner potential is like the seeds that we plant; some of those seeds sprout and thrive to be healthy, others sprout yet are destroyed at a young stage, others do not sprout at all, and others are like massive trees that take most of your life to germinate and slowly start to grow. The small tree takes decades before it even looks like a tree, then it takes several more decades to be a strong, firmly, and deeply rooted tree that can withstand the torrential storms of life through all the seasons of life. In many ways, its my feeling that all of us have some deeper innate sense of what we are doing here and what we are innately drawn to that we find fascinating. I find that when you are here to do something, that energy will guide you in life, rather than you being the one who is in control. Instead, you are being guided through some deeper innate knowledge that starts to manifest all around you through every possible avenue. I have experienced this many times in my life, as all of us are here to contribute to the world through some unique and beautifully authentic expression by allowing ourselves to fully embody our highest potential in life, as the innate nature of our self and the life we are choosing to live. We too must allow life to germinate our inner potential, as the lotus will inevitably blossom and share its immanent radiance, so must we brave the many challenges before we too blossom into our higher potential of being.